Sensuality is a pathway to connect with our divinity. 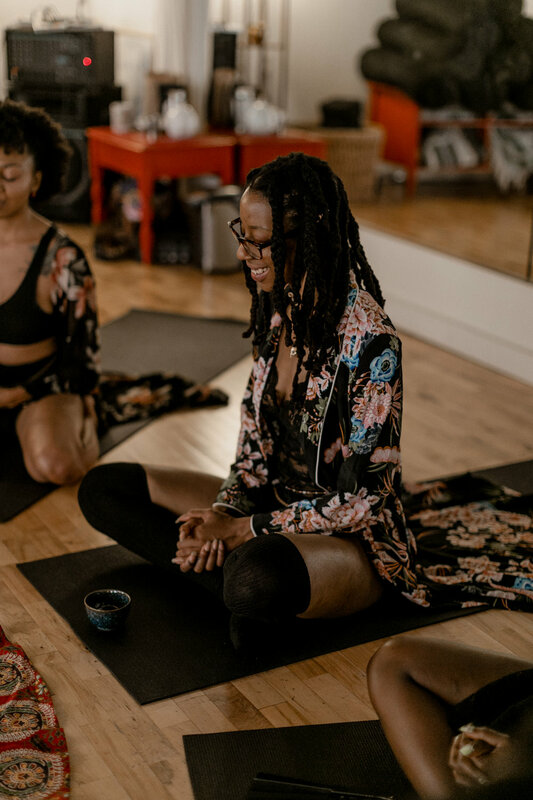 This space was created to introduce women (of all backgrounds and ethnicities) to the strength, power + awakening that lies within rebuilding + deepening the relationship with their sensuality + femininity. Through sensual movement + breath-work, women explore their bodies, practice moving with intention + unleash their sensual + feminine energy in the presence of other women, in sisterhood. Sacred Feminine Yoga includes a sensual Yoga flow + sister sharing circle with tea ceremony. Sensuality is the experience of pleasure through our five senses. On a deeper level, when we grant ourselves permission to have pleasurable experiences with + through ourselves, we open a gateway to ourselves, to our divinity + we remind ourselves that it is our birthright to experience pleasure. Sensuality is presence. As humans, and especially as women, we deny ourselves of pleasure, daily because we forget to be present. Sensual energy is healing because it brings us into ourselves on every level (mental, physical, emotional, spiritual + energetic). Sacred Feminine Yoga is a sacred space for women to access this healing power + energy without judgement or shame. Through slow intentional movement, we explore our bodies (touch), while listening to music that inspires this movement (hear), taking in aromas of sacred smoke (smell) + taking in our transformation before our own eyes while moving through the entire class looking at ourselves in the mirror (sight). We close with a tea ceremony + sister circle (taste). Click a city below to get your tickets for the Sacred Feminine Yoga 2019 Tour!